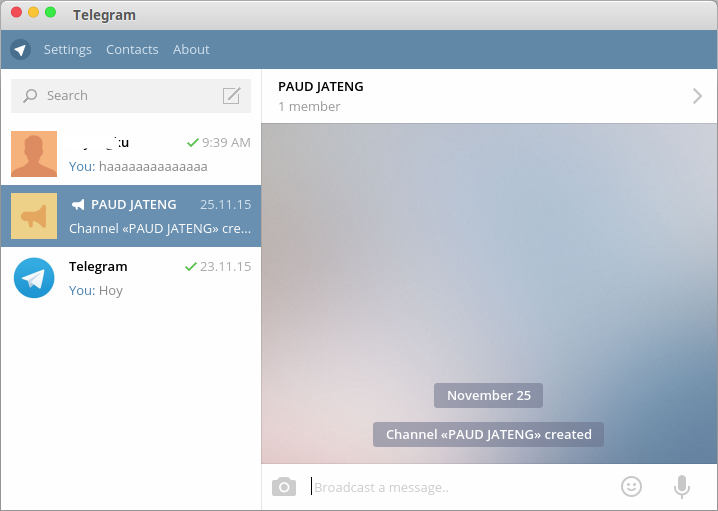 Telegram, A Messenger Program for Linux With File Transfer Features. This guide will show you how to install Telegram Desktop on your Linux computer and short review about it. With Telegram, you can send file type supported such as doc, zip, mp3, etc. You can also send photo, video, messages as well as create groups for up to 1000 people or channels for broadcasting to unlimited audiences. You can write to your phone contacts and find people by their usernames. As a result, Telegram is like SMS and email combined — and can take care of all your personal or business messaging needs. Telegram is for everyone who wants fast and reliable messaging. Business users and small teams may like the large groups, desktop apps and powerful file sharing options. Since Telegram groups can have up to 1000 members, we support replies, mentions and hashtags that help maintain order and keep communication in large communities efficient. In case you're more into pictures, Telegram has animated gif search, a state of the art photo editor and an open sticker platform. Unlike WhatsApp, Telegram is a cloud-based messenger with seamless sync. As a result, you can access your messages from several devices at once, including tablets and computers, and share an unlimited number of photos, videos and files (doc, zip, mp3, etc.) of up to 1,5 GB each. Telegram support security and "Secret Chat" --With this secret chat your message or data sent to your contact destination directly without leaving any trace on Telegram server.